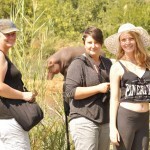 Turgwe Hippo Trust welcomes volunteers to Hippo Haven. We are a very hands-on non-profit set-up and the animals that we care for here are all living natural lives in the wild, not in captivity. 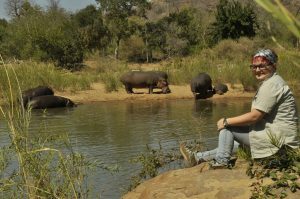 As a volunteer, you will assist us with the day to day work involved in monitoring 4 groups of hippos that live below us in the Turgwe River in Zimbabwe’s wild Lowveld. 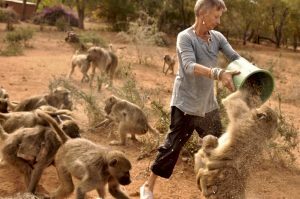 You will be a part of our lives among the baboons, vervet monkeys and other animals, and if you’re lucky will get to see animals such as elephants, impala, kudu, warthogs, to name but a few that roam freely around our home. 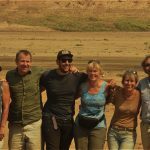 This is a very personal volunteering experience, with a maximum of two volunteers at any one time, giving you a real chance to breath in what Africa and life in the wild is really all about. 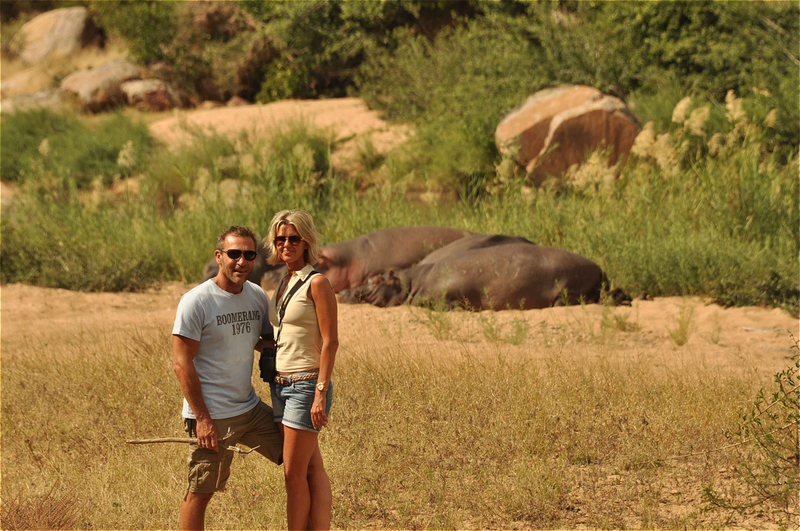 Stuart and I stayed at Hippo Haven in 2012 and have always looked forward to coming back. We had a fabulous time then but the most wonderful thing that happened from that visit is that we have become great friends with Karen and Jean-Roger! Such a treat therefore to return to this wonderful place and see the amazing work that is done here. It is a home full of caring and love. Looking forward to being back again and again! 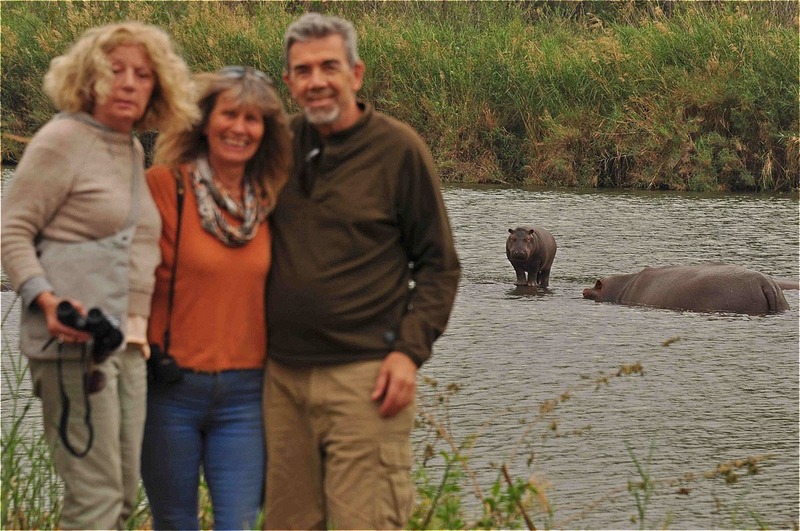 Karen & Jean-Roger thank you for our stay (we won the draw to come along to Hippo Haven in 2018) It is a beautiful place with incredible views from your terrace. We loved all the animals especially seeing painted wild dogs from 15meters away! 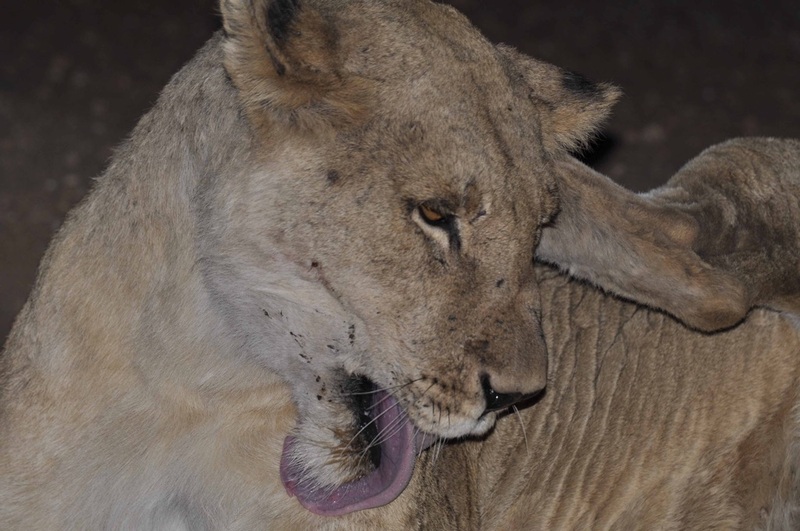 After they killed a female impala. 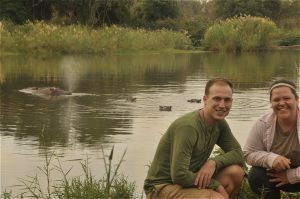 We loved the beautiful hippos especially my adopted hippo Kuchek. Thank you for this unforgettable stay. 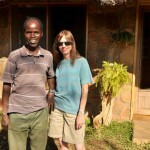 My stay here fulfilled all my expectations of coming to a “real Africa” n ot by the Safari route. 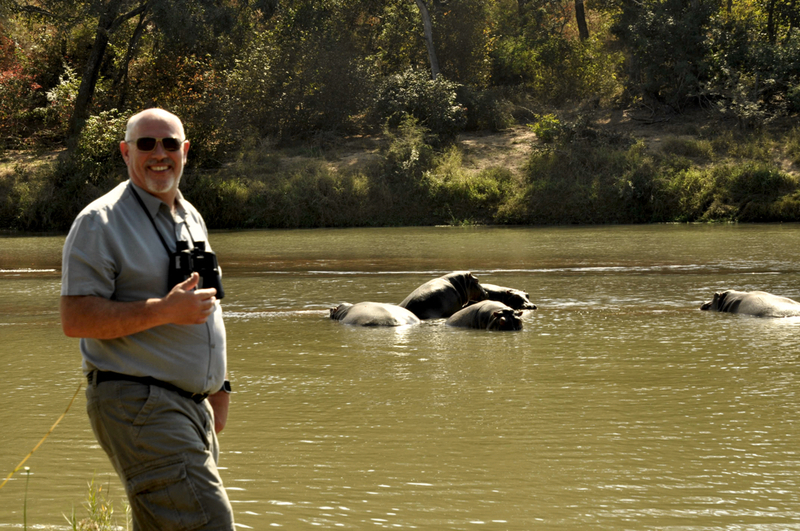 I came away with real respect for hippos and elephants after our encounters. From the moment we entered this area to the time of our departure I have been totally enraptured by what is around you and how you are one with it all. Thank you Karen and Jean-Roger for an incredible experience. 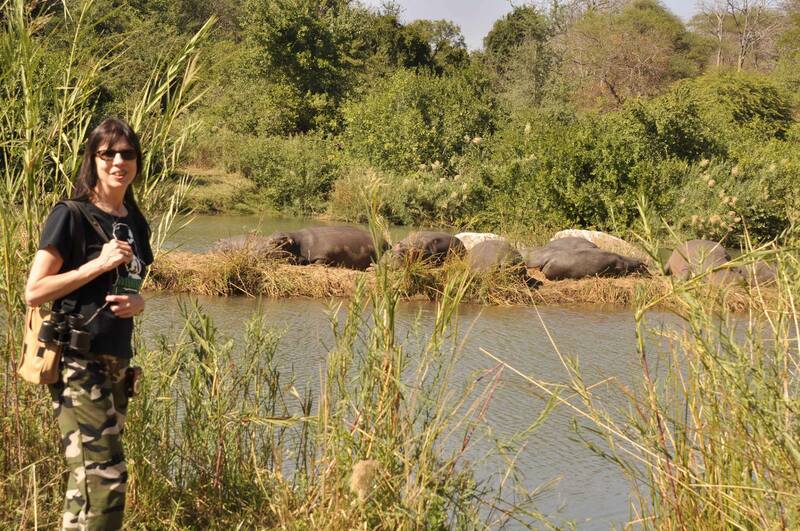 An amazing place full of character, hippos and possibilities. 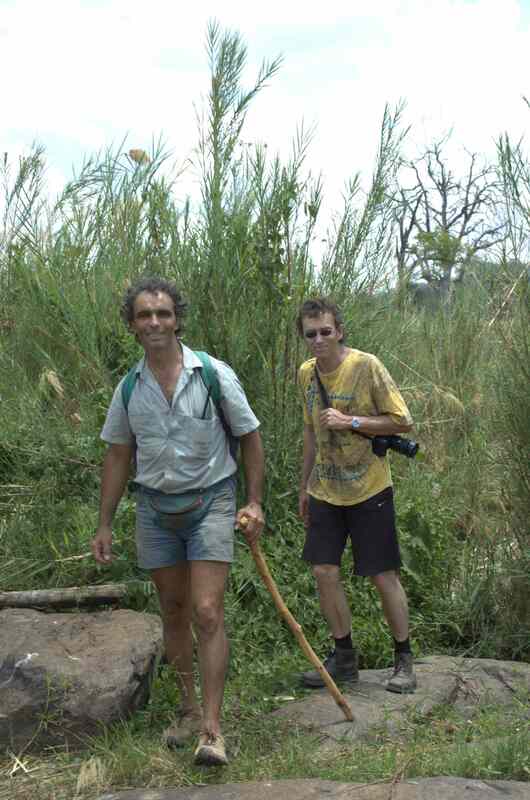 Provides a true look into bush life and wilderness of Africa. 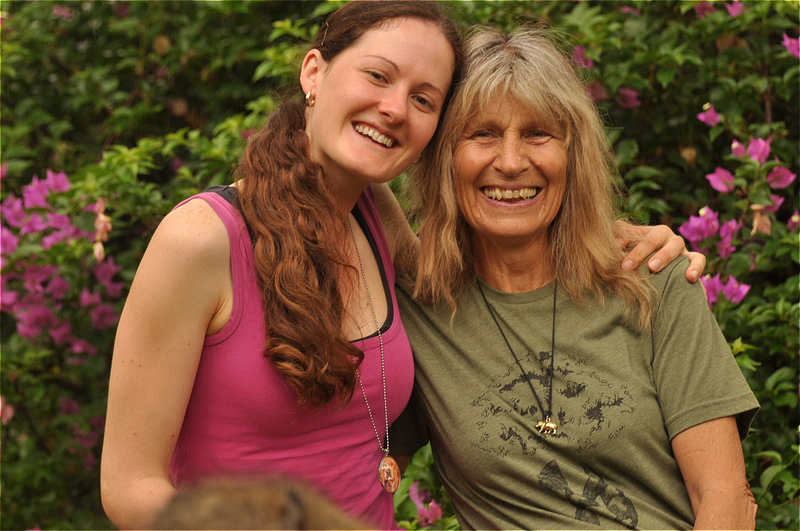 Thank you for sharing your home, love of animals, and true appreciation of the world. Hope to return again soon for many more adventures. Thank you for an amazing 10 days here. 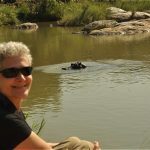 I’ve loved being out in the bush every day, seeing the hippos up so close on land and in water, the cute baby hippos and all the other animals of the bush. 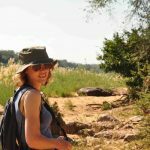 Trip to Gona-re-Zhou National Park with you was amazing with lions, eles galore and spectacular scenery, most of which I could see from my tent! 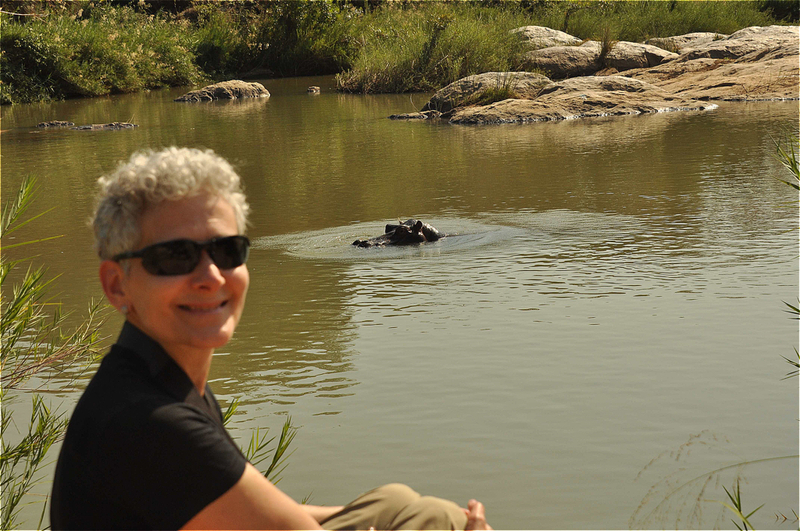 Will miss the serenity of Hippo Haven and especially you and Jean-Roger, the cats, the baboons, genet, monkeys, warthogs, and bushpigs and the yummy food. Hope to return again soon. 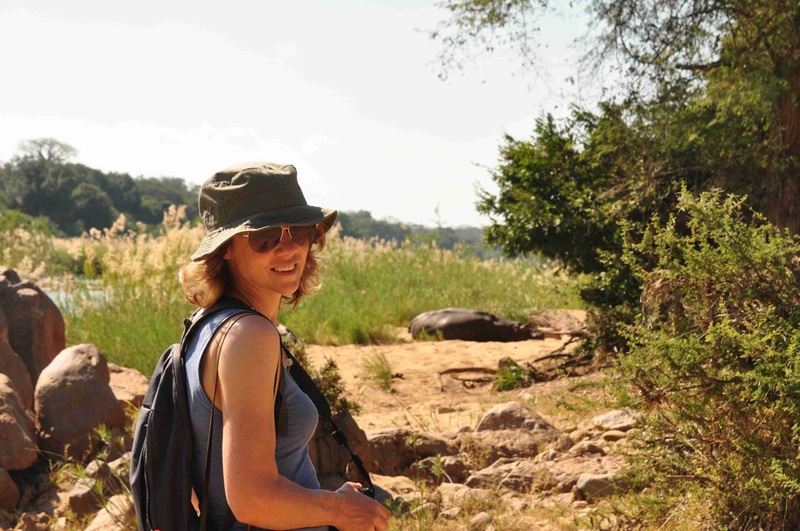 Our first few days back in Zimbabwe for a months holiday and a perfect place to wind down, enjoying in the bush and watching wildlife and catching up on news/stories – we will be back and please keep up your amazing work here in Zim. Thank you for trusting me with your animals and your home, it was an honour and absolute pleasure taking care of them and your home. The lessons learned when visiting here are still many, I look forward to the next time. Thank you for all that you do for the animals for your patch of bush and for the people that support your work. With much love from Miri. I bought your book A HIPPO LOVE STORY mid September 2016 as I was leaving Joburg and Africa. 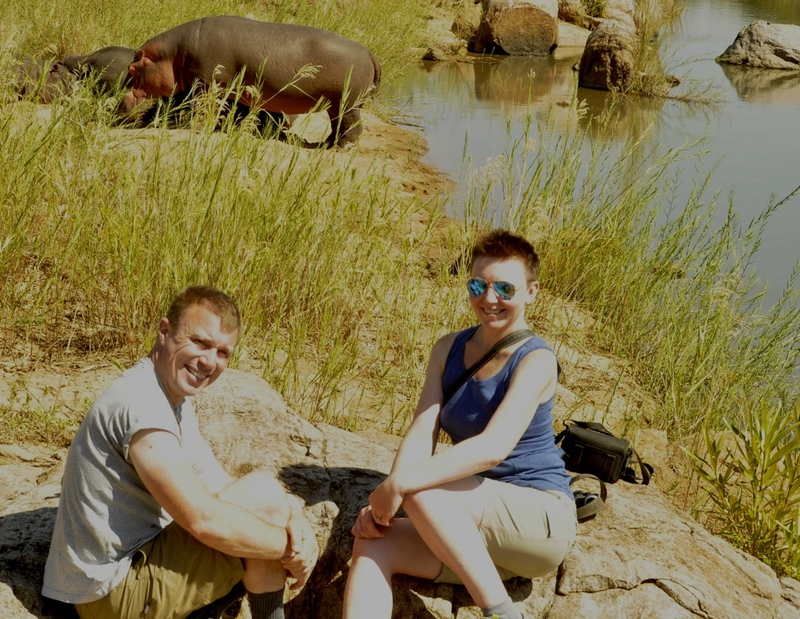 I was thrilled when I contacted you and you said I could come to visit and have so thourougly enjoyed my time with you and Jean-Roger, the hippos and all the other wild animals. It is humbling to see what you have done so determinedly over all these years. Highlights: being the first volunteer to see baby Richard/Laura hippo such a cutie. Bumping into a bush pig on the way back to the cottage! 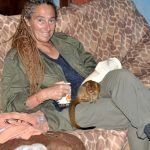 Sitting watching films at night with the two of you – sometimes with a Squiggle mongoose on my lap J The flocks of birds, the herd of 40-50 elephants in the dry riverbed, being able to paint the hippos standing near them on land. 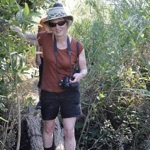 Thank you for an insight into bush life, the wild life here, snare patrols and the hippos. 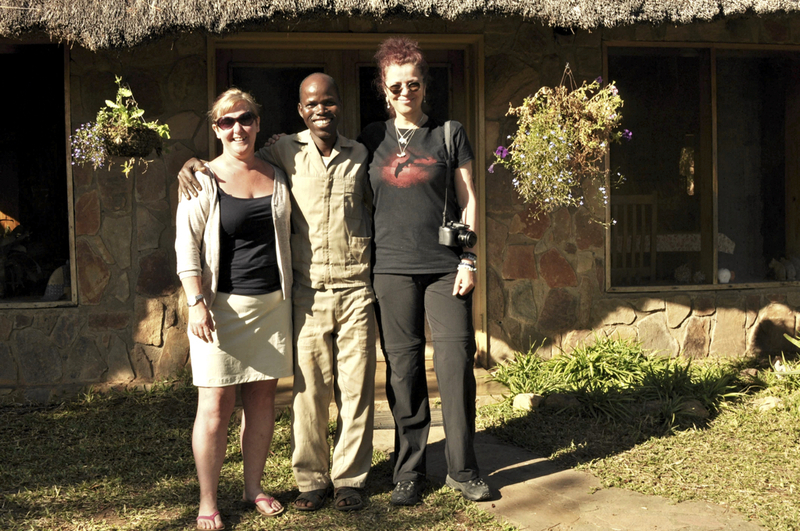 Winning the stay here at Hippo Haven convinced me that I am truly a lucky person. You two opened your home and hearts to me and I am truly grateful. 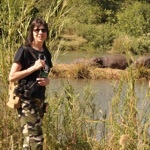 Meeting all the animals but especially the hippos and hearing all the fascinating stories was beyond my wildest dreams. Thank you for this life affirming experience. It’s been a privilidge to visit your hippos and all the other animals. Our first time to Africa and certainly a huge eye opener for us. Thank you for all that you do for the animals and the land. It was like being home for me. From start to leaving it just felt so comfortable and alive. 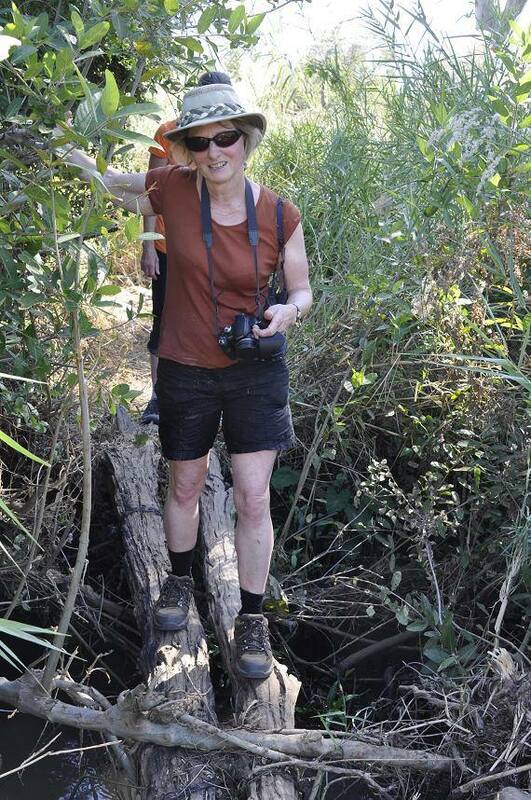 Thank you Karen and Jean for creating and maintaining this gateway to a wildlife paradise. 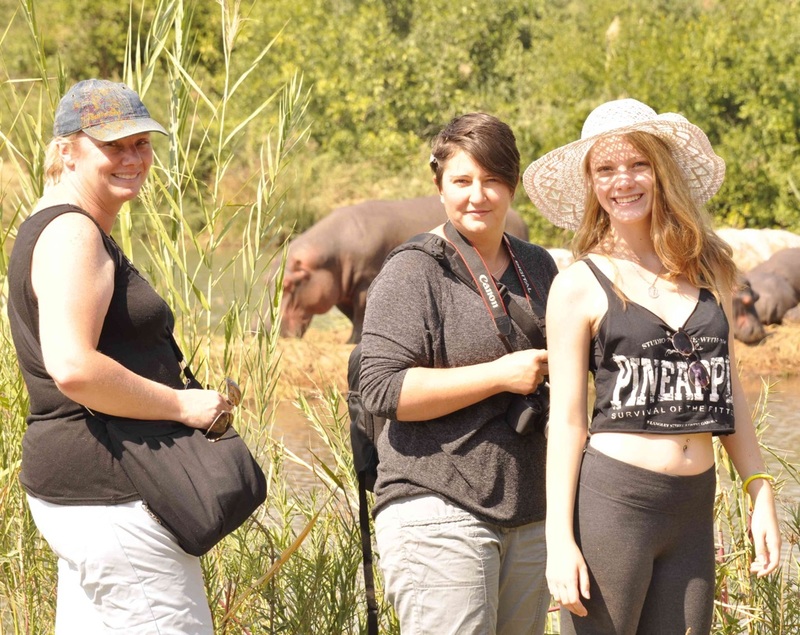 Not only the wonder of the daily close up visits to the happy and contented hippo families but enabling us to share the landscape, birdlife and all the other animals. You deal with many daily difficulties with determination, humour, and warmth towards your visitors with the overall love for all the animals. I have had a marvelous and life enhancing week, thank you. The miracle of life and respect for it all in this most beautiful oasis of healing and love. I will never forget all the sights, sounds and smells of this amazing place, and that somewhere in this universe a profound message has been sent and received. Thank you for it all, loving you both so much and until the next time here, China or Vietnam Bear hugs and blessings. Jill. What a whirlwind of a visit we have had. 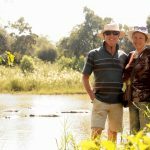 Highlights include painted wild dogs, numerous enchanting elephant encounters, Wiley the crocodile, Squiggle the slender mongoose and of course the majestic hippos that we have been able to get so close to. We will never forget their flicking ears, awesome gapes and guttural bellows. What a fantastic experience! I said I would be back and this time there were even more animals due I know to all your hard work feeding the hippos and other animals through this terrible drought. We saw painted wild dogs and had 10 puppies playing just behind the car. 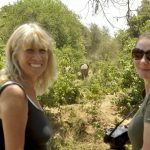 I think we have seen elephants nearly every day! We even saw lions very briefly and I will be back. Keep up your hard but great work. Thank you my dear friend. Being here has given me much needed inspiration and will recharge and refresh me Christian. You two are incrediably inspirational, hilarious and wonderful. I will never forget this experience and will continue to rave about it to family and friends. Courtney. As my first time over seas this was incredible and absolutely unforgettable! You are so inspirational and I can’t put into words how lucky I feel getting to be a part of your work. Once in a lifetime is an understatement. This experience has changed my life! I will see you again, and remember: creepers do break! Garrett. I will never forget my time here. Truly an amazing experience, and I thank you for sharing your world with me, and for saving me from Brutus! Thanks for the laughs & cabbage fun. Rachel. What a simply wonderful piece of paradise. A true wild life experience. 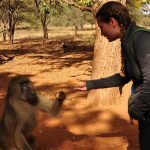 As an Africa nut and an animal lover, the time here has been insanely good. 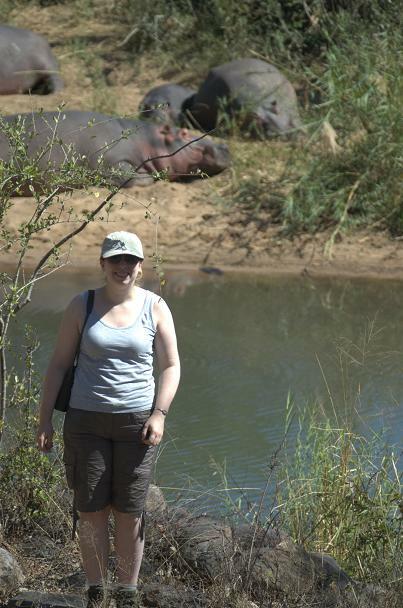 The hippos are astounding as are all the other animals I was lucky enough to meet. Words are really not enough for such a magical place as this. The peace and tranquillity, broken only by the sounds of the monkeys and baboons shouting and scampering across the roof, is calming and restoring. Hearing the lion’s roar during the nights and the waking to the birds singing as they greet each morning is truly one of the best things in the world. 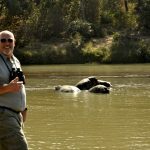 And just when you think it can’t get any better, you take a walk with Karen, through an animal made track down to the river, which, while it must be magnificent in full flood, is low enough to wade across to get to our goal……the hippos…….to stand just meters away from these amazing creatures is awe inspiring. You read that a hippo can weigh up to 3 tonne, and you think “yip, that’s pretty big” then you see one, not a fully grown 3tonne one, just a young male or female and you realise just how big they really are! Their heads lift as they hear you approach and to see them relax as Karen greets them by name and talks to them has to be seen to be believed. They are happily sunning themselves on a sand bank, enjoying their sleep, digesting their night’s feeding. If you’re lucky one might get to its feet and take a walk, or groom another and treat you to a wide mouthed gape, driving home again their size and strength. 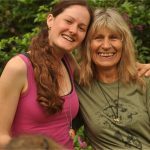 Karen and Jean are amazing hosts, full of knowledge and information, Karen is passionate about all the animals, but especially the hippos and we never tire of hearing her stories and information. The excitement of collecting the trail cam cards and seeing what animals have been to visit the area, seeing, among others, predators including lion and leopard and hyena that have been close to the house but you have never heard them, would never even have known they were there, knowing that you are one with the bush, that the animals are secure enough to be around the humans is nothing short of breath-taking. To go on a game drive and see such a variety of buck, elephants, giraffe, warthogs, buffalo, birdlife and we were spoilt with Painted Wild Dog pupps makes it a trip never to be forgotten. 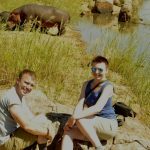 My latest (and third) visit to Hippo Haven was quite the adventure! 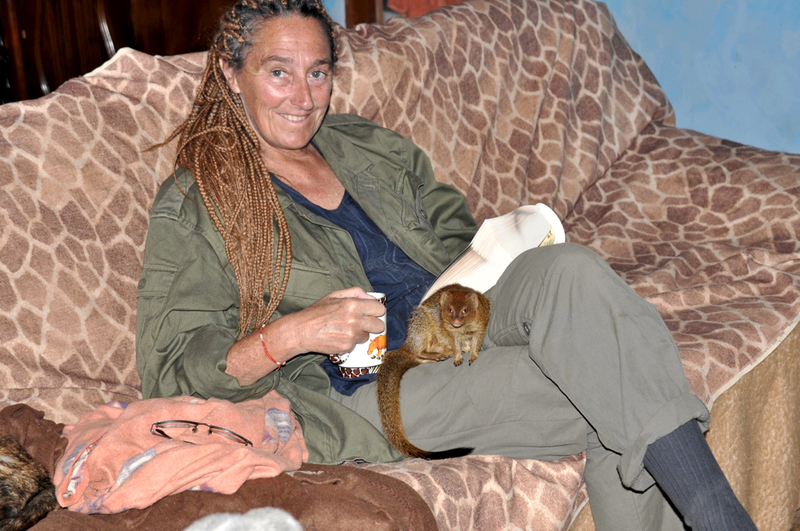 Having visited prior, and having read Karen’s book, it was no surprise to me that their life is far from paradise. 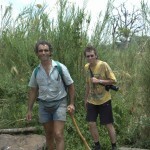 There was trouble with poachers (as well as hunters) from the moment I arrived. So we were on high alert much of the time. But the animals make everything worth it and I had some truly amazing experiences. 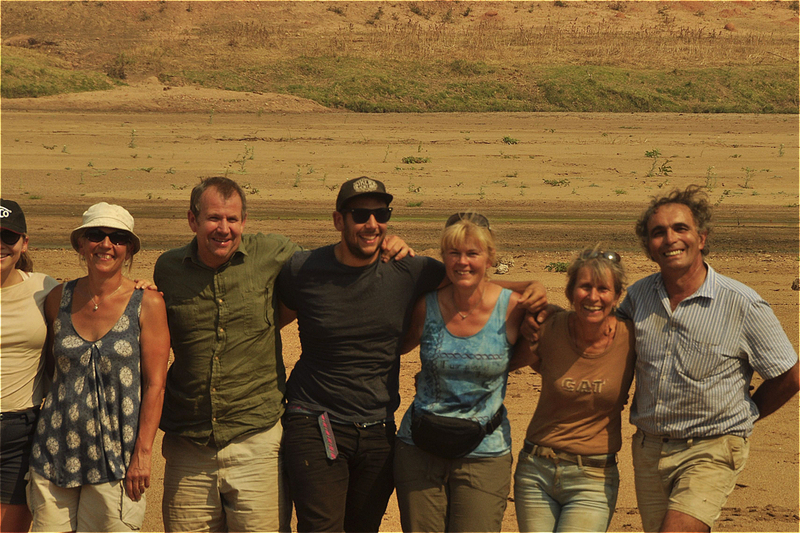 Perhaps the best day for all of us was our trip to Gonarezhou National Park (Gonarezhou means “the place of elephants”). I had already been excited to have seen elephants on this visit, including the one day Jean-Roger and I went to get drinking water and one walked right across the road in front of the car, then stopped and turned at us; we thought it might charge but it just took a few paces, looked at us and walked off. 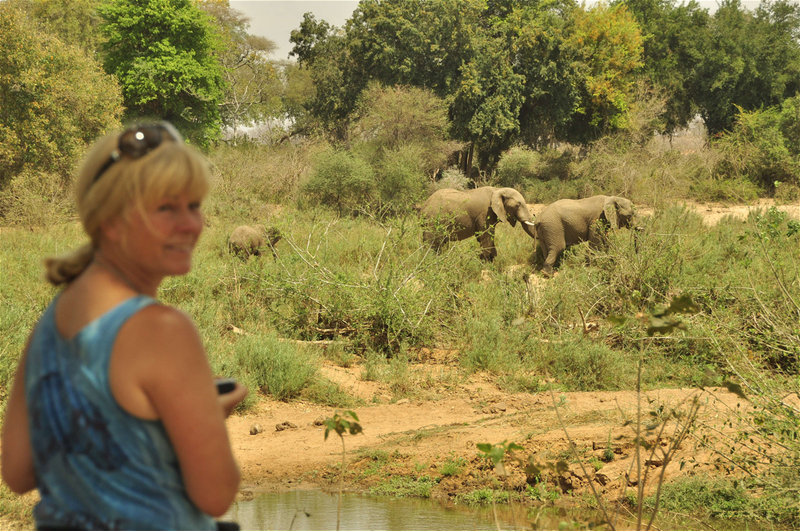 And then Karen and I had an incredible encounter late one afternoon with what started off as 2 and wound up being 3 male elephants at a small water hole where we stood on the other side and marveled at their peaceful and awesome presence for quite some time. 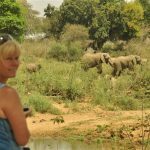 Upon entering Gonarezhou we came across many elephants culminating with a herd of females and young that came very near to our car. Unprecedented to be that near to wild elephants and they did not show any aggression toward us. We had a picnic lunch by the breathtaking Chilocho sandstone cliffs. 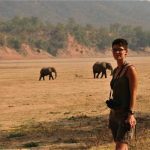 Karen and I walked out to the middle of the Runde riverbed (it is the dry season so the “river” was a trickle) and suddenly in the distance we see elephants one by one crossing toward the water. It was almost like a mirage. As we were leaving the picnic area an elephant was busy blocking the road so we exited another way which is when we ran into the aforementioned herd. 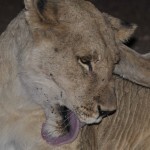 And as we were exiting the park at dusk, we came across a group of lions sprawled out in the road. They were not about to move for anyone so we sat and watched them for about 10 minutes, one lying right by the front wheel. We saw lots of other amazing animals as well (including grysbok, kudu, klipspringer, eland, duiker, nyala, impala, and of course a large hippo group). Another day Karen and I came upon a herd of buffalo, at least 60, in a riverbed. 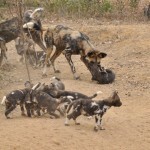 And on my last day we sat by a wild dog den near sunset to witness the packs pups emerging. 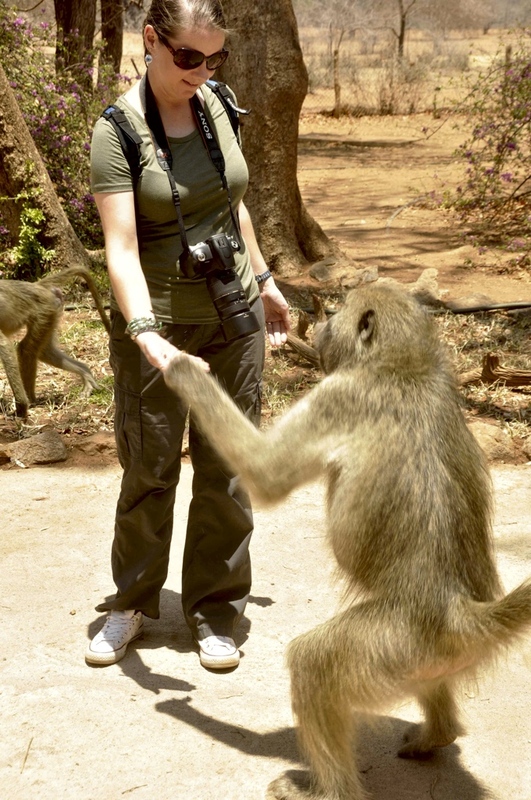 These are all very unique experiences for any visitor to Africa and I treasure each and every one of them. 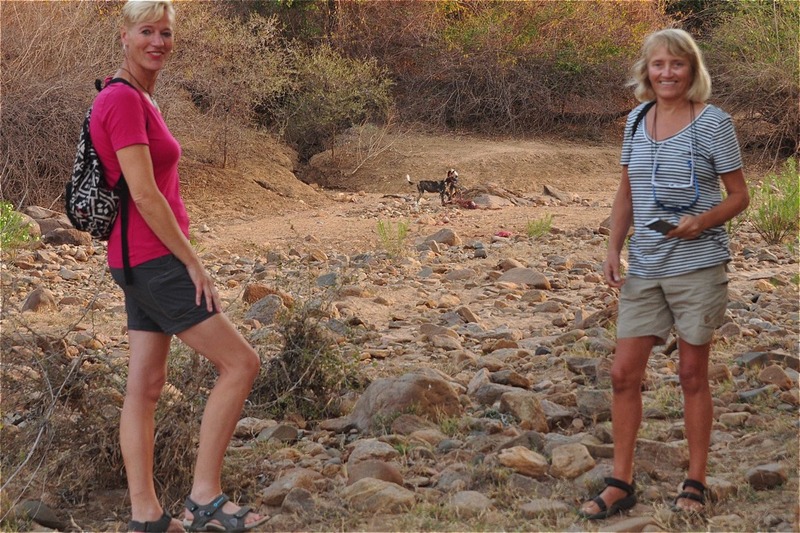 It would not be possible were it not for Hippo Haven and the hospitality of Karen and Jean-Roger. 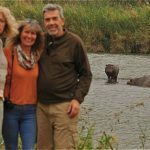 We (a family of 4) spent a week with Karen and Jean-Roger at Hippo Haven and had the best time of our lives. It was magic. 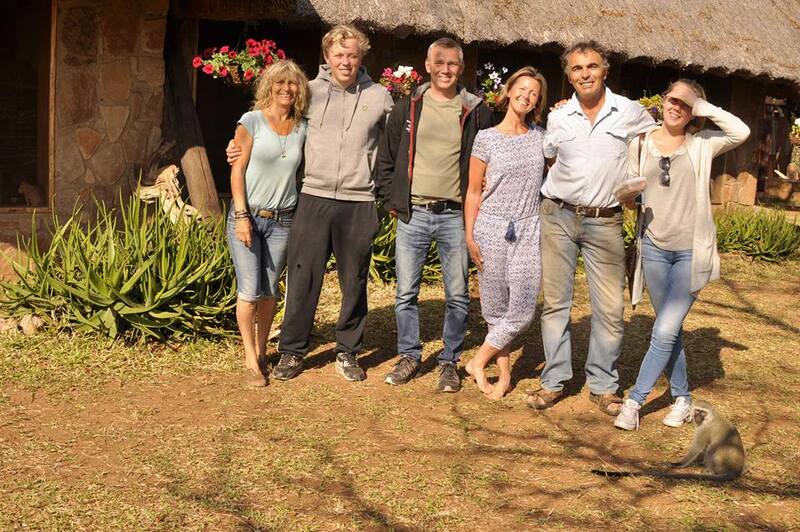 This remote haven was really one of a kind, with all the animals, such as funny baboons, cute vervet monkeys and majestic hippos around the corner. 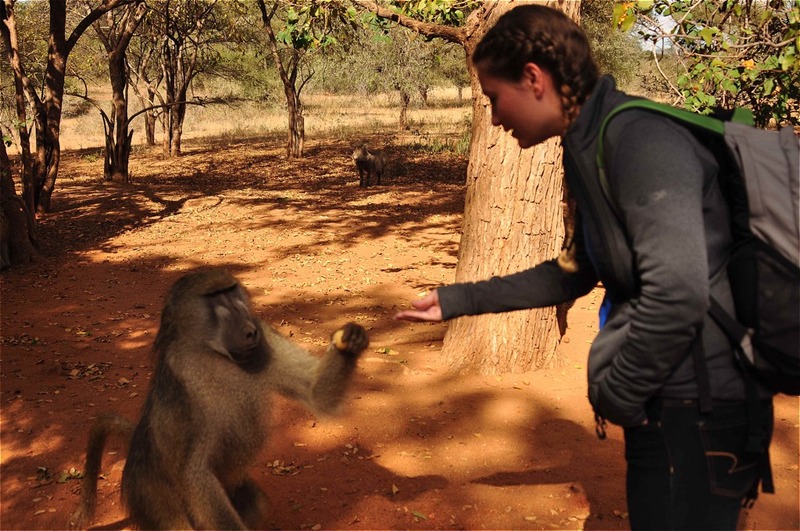 To give treats to the wild baboons every morning and to walk down to the river and watch the hippos was amazing. During our stay we had the best of luck and got to see several painted wild dogs and their beautiful puppies coming up from their den. We sat silently watching the grownups, circulating around the car, for nearly two hours. Then suddenly they felt safe and called for the pups to come out. There were about 7 – 10 of them, absolutely adorable. 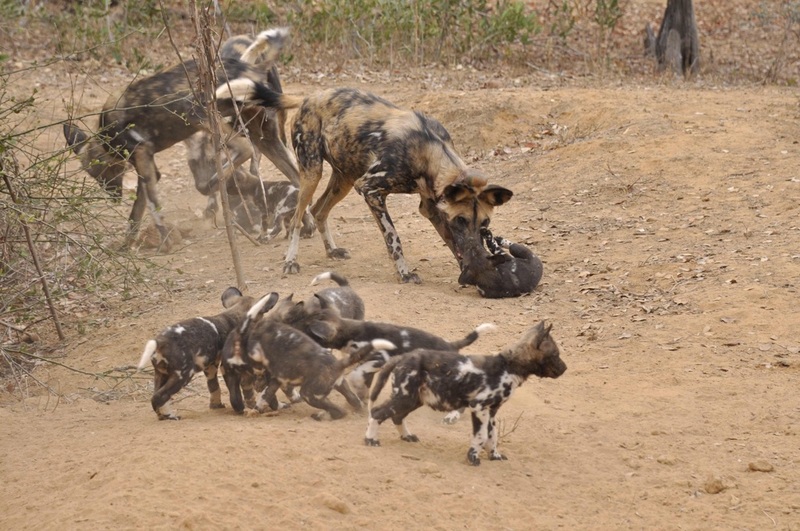 The wild dogs were actually the no 1 on our wish list of animals to see, and we were thrilled to be there and experience their behavior and beauty. We got to see so many beautiful animals, such as a spotted hyena, elephants, giraffes, buffalos to name a few. 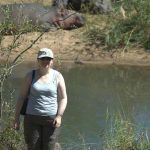 But the hippos were the ones that made a great impression on us, since we went to see them almost every day, only a few meters away, on the sandbank. To see them gape, and also to hear their trombone-like sound was amazing. The little ones, George and Darrow, were so cute, and Kutchek was easy to recognize with his astonishing head and size – a true alfa male. They all seemed so at peace and calm, allowing us to be there watching them. Of course we had to adopt four of our favorites when we came back to Sweden. But what also made this week so special was Karen and Jean, and their beautiful home. You rarely meet people like them in life. Their hospitality, sense of humour and dedication to their work with animals is outstanding. We learnt about the hard life in Africa, by listening to their incredible stories, but foremost, we saw the wonders, the every day beauty in this scenic place. It was truly sad to leave Hippo Haven. 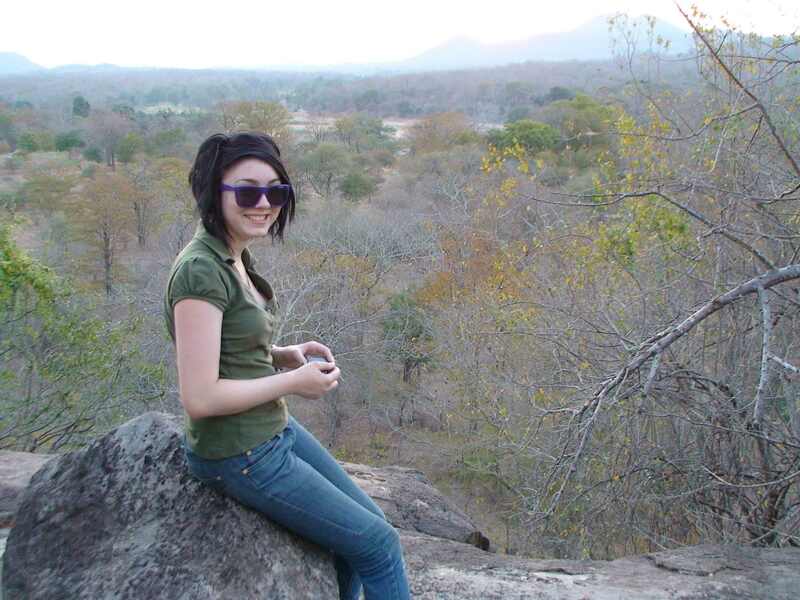 This was our first time in Africa, and Zimbabwe is definitely a country to return to. Thank you, Karen and Jean, for having us and making our stay unforgettable. Had a wonderful 10 days with Karen and Jean Roger in June. What a lovely place they have. 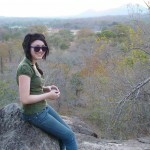 So enjoyed the baboons and monkeys each morning, whilst we had coffee overlooking the river. They are very funny and fascinating to watch. Walking in the late afternoon in the forest was thrilling. The colours from the setting sun made everything glow. You never quite knew what you would see around the next corner!. We were fortunate to see a very tiny baby elephant with its family. Did see the family again early one morning, only the backsides, as they were walking away from us. No messing with that family with such a tiny baby there! 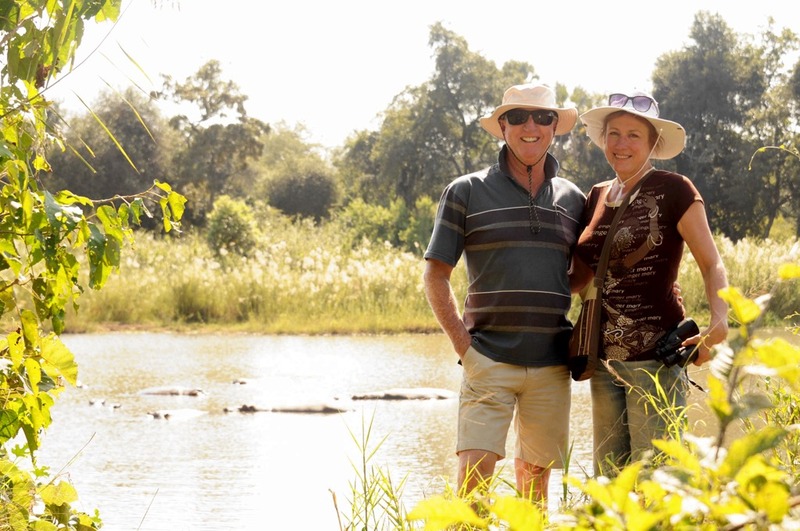 Karen and Jean Roger work hard to protect the hippos and other wildlife. 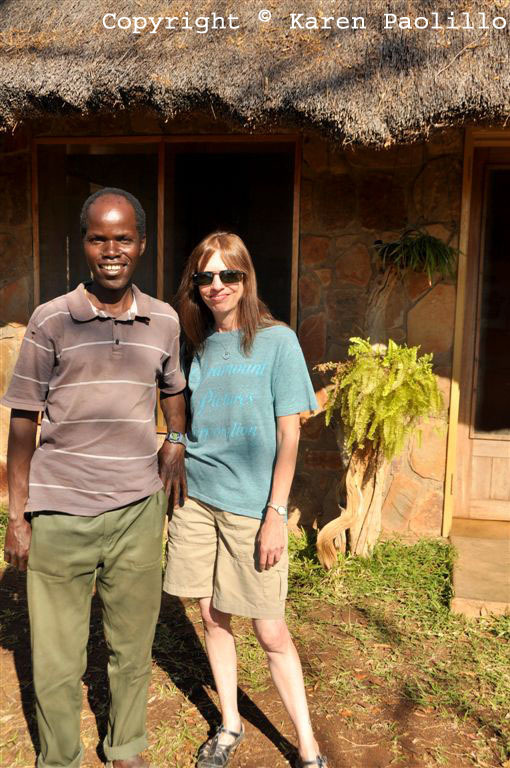 We were made to feel very welcome and so enjoyed seeing this tiny part of Africa from a different vantage point. 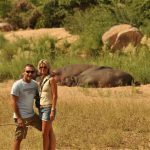 If you are someone who craves the experience of what it is like to actually live among wild animals in the bush, this is it. If you feel calm around the animals, they will fascinate and delight you no end. And if you are a dedicated advocate for animals as I am, this is direct action at its finest! “Hippo Haven has a healing effect on both the body and the mind. I slept deeply the first night in my cabin overlooking the Turgwe River, awaking to absolute serenity. One wall is open to the elements, covered with mesh to keep out the animals, so you are basically living outdoors”. 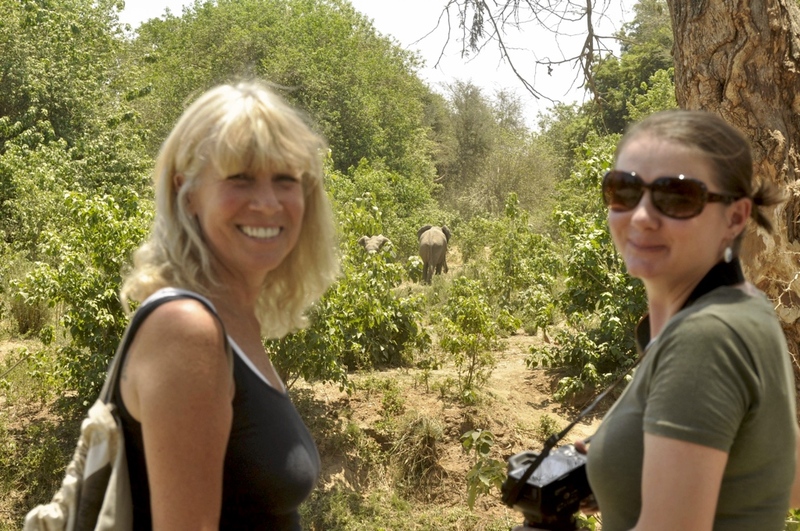 “Visiting Karen and Jean at the Turgwe Hippo Trust is an unforgettable adventure. 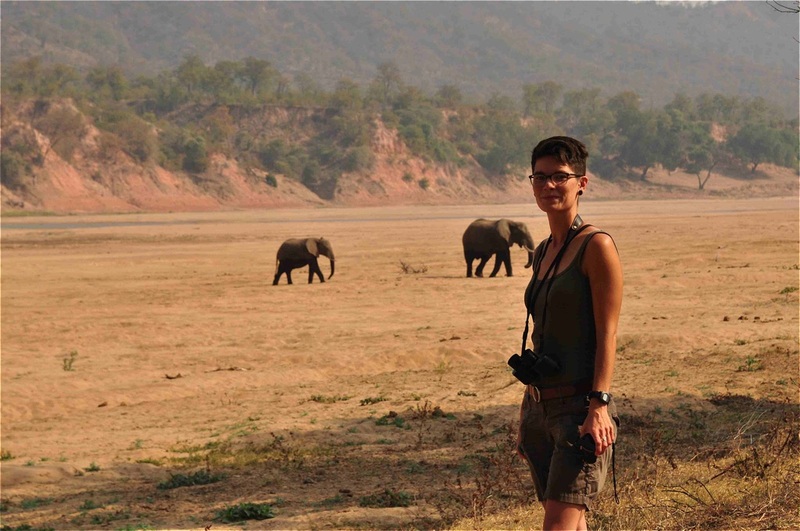 The location is just stunning; the proximity to the animals exhilarating. Equally the hardships that they are facing daily are for real”.